SYNOPSIS: Gary Hart, former senator of Colorado, becomes the front-runner for the Democratic presidential nomination in 1987. Hart's intelligence, charisma and idealism makes him popular with young voters, leaving him with a seemingly clear path to the White House. All that comes crashing down when allegations of an extramarital affair surface in the media, forcing the candidate to address a scandal that threatens to derail his campaign and personal life. A post-Wolverine acting career sees one of Australia’s hottest exports, Hugh Jackman as a greatest showman and now a disgraced senator, Gary Hart in The Front Runner. In the 1988 presidential nomination, Hart is touted as the hottest candidate for the post of president hence the title, The Front Runner. His campaign however came to an abrupt end when The Miami Herald published reports of Hart’s alleged extramarital affair with a certain Donna Rice after stalking Hart’s whereabouts. Based on the 2014 book All the Truth Is Out: The Week Politics Went Tabloid by Matt Bai and directed by Jason Reitman (Juno, Up In The Air), The Front Runner is a cautionary tale for politicians wannabe. Never ever taut the media it seems. Perhaps Gary Hart would have been the 41stPresident of America and not George H.W. Bush if he had not challenge the press to follow him around on non-campaign days. For a heavy theme movie that is closed to two hours, Reitman managed to keep things breezy and cohesive to the laymen. It can be both a drag and a mess to see Hart working things out with his campaign team and the press if you are not in the mood for a talky movie. At the same time, there’s frequent cutting to the discussion tables of The Washington Post and The Miami Herald. Thankfully, for most of the running time, The Front Runner offers an in-depth, fascinating look into the love-hate relationship between the press and politicians. It’s kind of disturbing to know that Hart’s belief that the capability of a Presidential candidate is far relevant than his private live somehow rang true in today’s political climate. Still, by the time the credits rolled, The Front Runner offers no new insight into the whole scandal nor is it willing to take a stand on the entire spectacle. It’s by far a respectable movie but never establish itself as political or journalism. Nevertheless, Jackman puts in a solid, believable performance while Vera Farmiga (The Conjuring) shows off a few heart-wrenching scenes as Hart’s long-suffering, supportive spouse. J.K. Simmons and Alfred Molina appears as part of the ensemble drama but the movie undeniably belongs to Hugh Jackman (sans claws) who at least deserved an acting nomination for his dramatic portrayal. There are roughly 4 minutes of Deleted Scenes, The Unmasking of a Candidate which had the cast and crew discussing the story, the current political and media climate etc and a detailed Audio Commentary which featuresCo-Writer/Director Jason Reitman, Producer Helen Estabrook, Production Designer Steve Saklad, Costume Designer Danny Glicker and Cinematographer Eric Steelberg. The DVD delivers a serviceable, balanced Dolby Digital 5.1 soundtrack which is clear and solid. 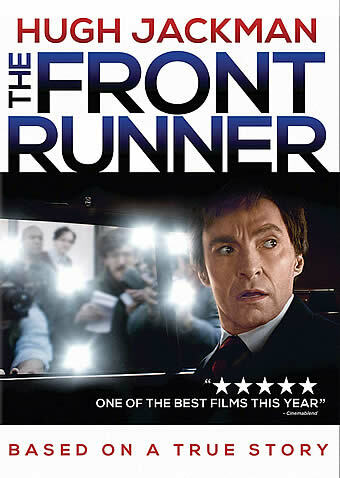 Shot on film, The Front Runner which took place in the late ‘80s looks appropriately good with an intended grainy look.